The eCommerce industry is booming with an impressive amount of platforms promising to take your startup to a new level. Undoubtedly, choosing the store engine is a crucial aspect for transferring young online retailer into a profitable and expanding business. However, it may turn to be a struggle for entrepreneurs whose budget is tight (for the time being, of course;)) and who are novices this demanding and competitive digital world. Luckily, there are many efficient and affordable options, and Cart2Cart is pleased to provide the best eCommerce engines for small business. But first, let's make 100% sure you have a deep insight of what is eCommerce engine, what it can give to you and why its choice is necessary for prosperous retail. Take your time and let's dive into gripping overview together! What is eCommerce Engine for Small Business? ECommerce platform is a software application that enables online businesses to manage their website and sell its products and services online. Depending on the eCommerce engine, it can build both a single page website or an extensive, highly-functional, multimillion product catalog. Why online visibility is vital for small business? Benefits of online presence are crystal clear. It ensures you boost in sales allowing to build a multi-channel store that integrates with world`s popular platforms: Amazon, Pinterest, Facebook, etc. Another reason is lower operating costs; you can run the store directly from home or whatever. A big plus is that e-commerce makes it possible to be online and available 24/7. What can't be left unnoticed is an advanced marketing, allowing you to promote your business utilizing platforms add-ons (Shopify`s Buy Button) and optimize your business to get top SERP results without extra costs. The next benefit is a tracking system, giving you accurate reports to follow the customers` flow and see what they want to find at your pages. It means you can collect the contact info of your clients and set new targets to their preferences. Let's turn to statistics: according to smallbiztrends.com eCommerce research, 51% of Americans prefer shopping online and 80 percent of them shop online at least monthly. After such news, you'll decide on launching an online version of your brick-and-mortar store, won`t you? Why to sell via shopping cart? Nowadays Amazon, eBay, Etsy marketplaces along with social networks are considered to be the keys to a prosperous retailing. But can they fulfill your small business potential? Running a standalone store has a broad range of benefits that are yet to be revealed in the next paragraphs. Obviously, rich on extensions eCommerce engines with flexible customization may tweak your store to a new level of uniqueness. It concerns both open-source shopping carts with progressive customizable options with free code modifications but more complicated maintenance and hosted solutions with easy-to-use functionality but less customization. The examples of open-source eCommerce engines for small business are WooCommerce, OpenCart, Magento, PrestaShop while world-known hosted solutions are Shopify, BigCommerce, 3DCart. It`s not a secret that good SEO is your lucky ticket! ecommerceCEO.com says that 77% eCommerce platforms have SEO-ready URLs that ensure top positions in SERP. Thanks to its cost-effectiveness and developed optimization, it`ll ensure your store an everlasting flow of customers without paying top dollar to ads campaigns. # You get all at once! A huge advantage is if your eCommerce platform integrates and synchronizes your stock with Amazon, Facebook, Pinterest and other platforms. Remember a while ago I mentioned that selling via marketplaces social networks won't exceed your expectations by achieving impressive results? If you integrate the online store with marketplaces + social networks, it`ll bring a phenomenal outcome. 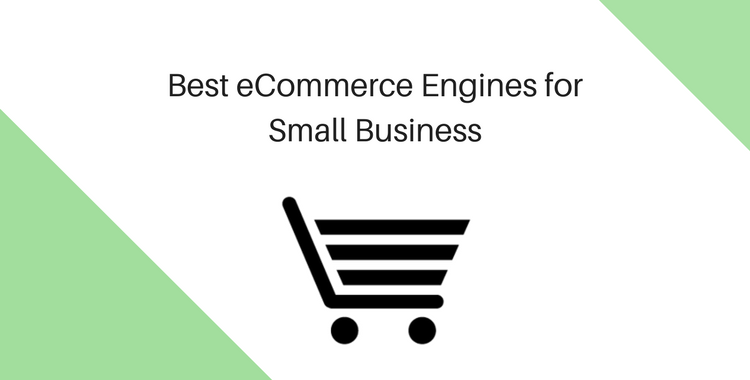 Most eCommerce engines for small business offer this functionality. However, instead of selling straight away from there, it`ll good to primary build your store with shopping cart and afterward to transform it into a multi-channel retail. Based on Ambassador research, 71% of users who are offered an appealing social media service experience with a brand are likely to recommend it to others. Regarding the fact that success of your business is equal the number of happy customers, we`re going to discuss the following. What do customers expect from eCommerce store? Lots of users before doing the purchase surf the whole Internet for the necessary product when many buy goods directly via cell phones. It`s essential to make a right conclusion and start ensuring such a pleasant shopping experience for your customers. Who knows, perhaps in some time (or very soon! ;)) mobile eCommerce will be the next innovation? Anyway, it's better to be alert to possible shift and listen to Forbes carefully claiming that 85% of active business pages use cell phones and 40% of active advertisers have created a Facebook ad on a mobile. Have you heard of the statement: “People judge the book by its cover”? The same goes with your online store. Make your store unique and attractive employing the crazily beautiful templates. Users like to feel cared about, they will ask questions and expect to hear the responses instantly. Pamper your users with special offers. A good example who has improved discounts is Shopify allowing you to customize every aspect of your products and apply them to various collections, locations, etc. What's more, according to founderu.selz.com statistics, 47% of all online orders include free shipping. In digital retail world, speed is money. Most consumers expect your site to load within 3-5 sec. Regarding this statement, Selfstartr.com demonstrates the statistics of eCommerce platforms loading speed where the average is 3.39 sec. 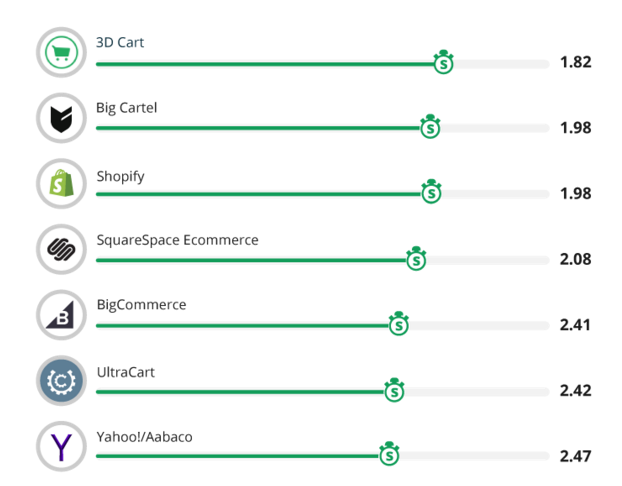 Thanks to number of accepted currencies and payment gateways, the three highest positions occupy 3DCart ( with 1.82), BigCartel ( with 1.98) and Shopify ( 1.98). Now we're gently approaching the next part of our interactive discussion: Which eCommerce engines will be a good choice for small business? I highlighted previously that it can be tough to see which eCommerce shopping cart suits your needs. Being a small business entrepreneur, you can choose a free platform and pay for developer assistance to set up the retail or select one of the the feature-rich, but paid, eCommerce engines for small business that is easy to establish. Everything is up to you, just be careful in your choice. Before weighing your decision, let Cart2Cart to help you to get a deeper insight of eCommerce shopping carts for small business available on the market. Hopefully, after this fresh overview, you'll find your perfect engine! Shopify, the most fastest-growing platform, takes the place of honor that impresses millions of store owners by its easiness of use, flexibility and developed customization options. The setup is easy-to-comprehend, allowing retail novices to maintain the site without tech assistance that is one many reasons why Shopify is a universal solution. Another Shopify`s strong point is advanced integration. Running the store with this engine allows you to add Amazon to a Sales Channel. All you need is to create Amazon listings from existing products and accept orders directly from Shopify Admin Panel. Shopify integrates with Facebook and Pinterest that boost your audience along with sales. Regarding the pricing, Shopify offers four plans where the price starts from $29 to $229 + some extra fees that take up to 2% per transaction. We can't say that it's the cheapest eCommerce solution, but it's the one that will dress up your store with the richest, all-in-one functionality. WooCommerce is a feature-packed and open-source platform (plugin) with around 1,986,393 online retailers and seamlessly integrates with WordPress. 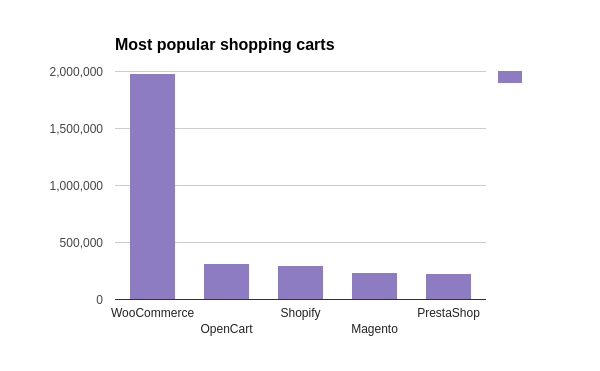 Based on builtwith.com statistics, it is the most widely used eCommerce engines and the reasons for such superiority are evident. WooCommerce offers the advantageous customization options having tens of fantastic, responsive themes. You can find 935 WooCommerce and WordPress themes in ThemeForest. With a code access availability, you`re able to customize them to your taste. It`s important to mentions that WooCommerce is a plugin itself meaning that almost all WordPress plugins will work out best with it too. It has a great variety of third party plugins (Yoast SEO) making your optimization efforts more effective. Speaking of the price, WooCommerce is a number one among eCommerce engines for small business as it`s free for downloading and use. It offers over 300 hundred extensions where a significant number of them are also for FREE. All that is achieved thanks to a worldwide development community who contributed a lot to extensions making many of them free ones. A great number of them are amateur and of different quality level but you can find top-notch extensions for your store. In comparison to Shopify, WooCommerce is more affordable and will be a great choice for small business owners more who are technically challenged and wish to deeply customize their shops. PrestaShop is another open-source and user-friendly representative of eCommerce engines for small business that constantly surprises its users with modernized innovations. Covering over 228,407 (builtwith.com) active stores, PrestaShop offers a well-thought-out interface that shouldn't cause trouble or confusion. Various admin activities are effortlessly executed with the maximum level of automation. Like Shopify and WooCommerce, PrestaShop is proud of enhanced customization level, giving the users multiple templates ( both free and paid) and that can be easily modified by means of a handy editor. One more reason for PrestaShop`s surprising popularity is its integration with global marketplaces such as eBay, Amazon, etc. PrestaShop has a large community and extensive forum with over 700, 000 members of skilled developers and simple users where you can find handy tips and solid documentation for store integration. We may say that PrestaShop will be a perfect choice for tech navvies or for those who`are going to built a large shop from the very beginning. BigCommerce, one of world`s competitively respected self-hosted eCommerce engines for small business that is a good alternative to Shopify if it by some reason doesn't satisfy your needs. In comparison to Shopify that greatly relies on plugins, BigCommerce has a far wider range of out of box features that may successfully meet all small business goals. Thanks to its user-friendliness, hundreds of store owners praise this engine for transforming everyday administration tasks into simple maintenance activities. Similar to Shopify, WooCommerce and PrestaShop, it has an extensive range of professionally-looking templates that can be painlessly customized by HTML or CSS editors. If you want to enlarge your store eCommerce opportunities, BigCommerce can offer you a huge app store where you can find the additional set of functions for your online store. In comparison to open-source shopping carts, BigCommerce, like hosted solutions, is a paid one with pricing plans that start from $29.95 to 249.95 per mo. However, no free open-source platform will give you such extensive apps, premium themes, and 24/7 developers assistance as feature-packed driver BigCommerce. So, carefully weigh your thoughts first before rushing to conclusions. So, the next move is yours, take your time to think which one of above-listed eCommerce engines will meet your targets and a lucky ticket is all yours. If you've already built your store and feel that current eCommerce engine does not fulfill your potential, Cart2Cart is there to help you! Thanks to a simple 3-step migration procedure that requires no programming skills and unprecedented switch speed will all entities perseverance, Cart2Cart has won the affection of more than 45 000 online store owners. Swiftly and secure, Cart2Cart will move your products and widest range of entities to 75+ eCommerce engines. If you have some tech-related questions, our 24/7 support staff will provide the best possible assistance. Your ship is coming in. Take your chance and start a Free Demo Migration to soar your business to greater heights!